J is for Jeff Dee Adventures. These adventures are not classics. In fact they are only a few years old. But they do have a solid pedigree. They were both designed and illustrated by legendary TSR artist, and co-creator of the Villians and Vigilantes game, +Jeff Dee. 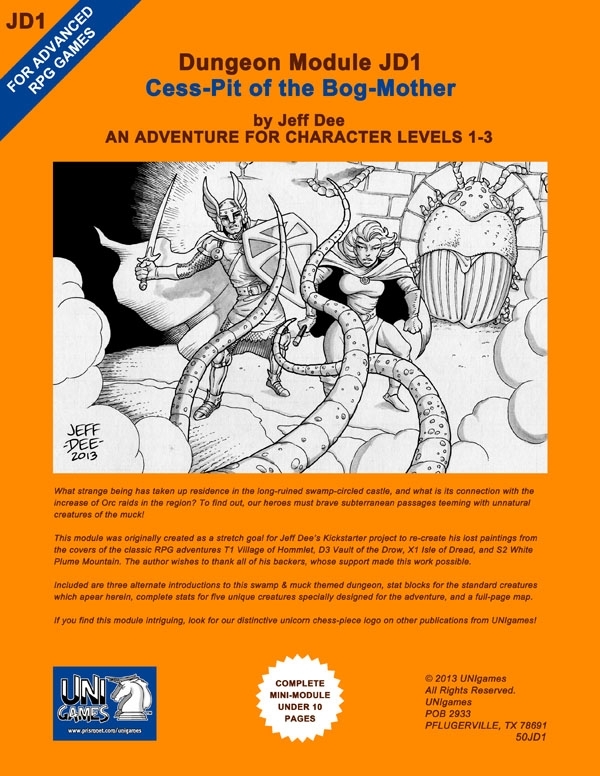 This is a fun little adventure for characters level 1-3 for your favorite Old-School game. At just under 10 pages it is perfect for a quick afternoon game. It would work great while traveling to another adventure or in-between towns. The map is repeated in b&w (blue and white) and full-color versions. Another mini-adventure, this time for a little bit higher lever adventurers. The basic idea here is to investigate the moor and defeat a cyclops causing trouble. There are three black and white maps. Given this is about a cyclops I could work it into the Giants series pretty easily. Both adventures are under $2.50 and you get an adventure you can run in an afternoon. Perfect for slotting in between other adventures or even to break up the campaign a little. Jemima, I loved Rogue. It was based off of a game called "Moria" which in turn was based on the classic version of D&D! I played it on my old Color Computer 3, but it was very much like the Spectrum version.